Students are back on campus this week to start the new spring term. And we know what that means! American Room in Welch Hall girl’s dormitory, 1949. Students standing outside the Hub, 1966. And, oh yeah, going to class. Students in class, circa 1960s. Wishing everyone a fun and productive spring semester! For more historical photos of student life at Iowa State, check out the Student Life and Department of Residence photo sets on our Flickr page. As some may already know, a selection of the photographs housed in the Special Collections Department have been digitized and put on Flickr. Other photographs from our collections can also be found on the library’s Digital Collections site (images on the Digital Collections site will have more information on the images). The images on Flickr and the Digital Collections site are only a few of the more than one million photographs in our university photograph collection, university archives, and manuscript collections. Above is one of the photos Ashley scanned as a part of her project. Pictured is a student in his Friley Hall dorm room working on homework in 1964. This past year, senior Ashley Rosener worked on an honors project here in the Special Collections Department. Her project involved research regarding digitization projects and processes here at Parks Library, and included the digitization and description of photographs of Friley Hall in the university photograph collection. Ashley composed a brief history of Friley Hall for the online collection, and then put together the metadata (descriptions/information) of each photograph. As is the case for all of our photographs on Flickr, the metadata includes a title, date and brief description of each photograph. To find the Friley Hall images from our Flickr homepage, go to collections (near the top), and then click on university archives and then buildings. As a part of her honors project, Ashley put together a poster which she presented last week. 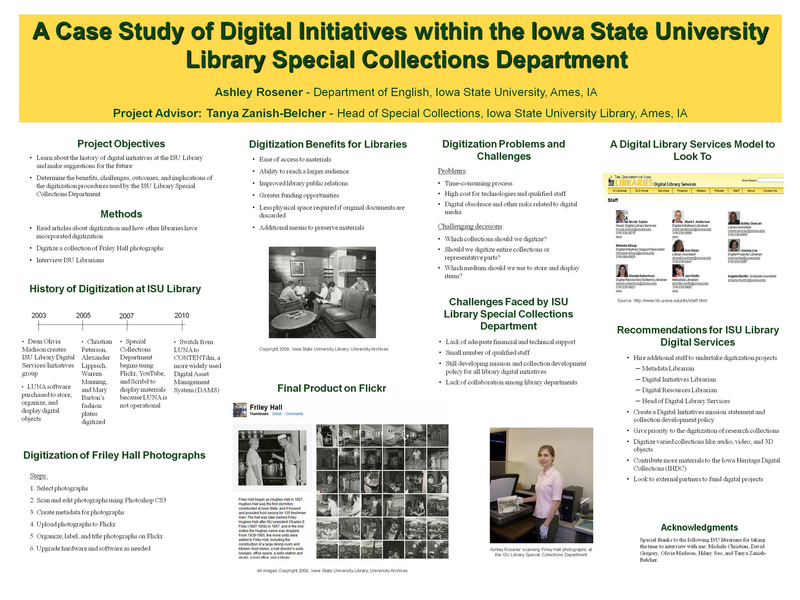 The poster, pictured below, summarizes what Ashley did, lessons learned, and recommendations for the library. Please click on image for a larger version. When asked about what she learned during her project, Ashley noted that Friley Hall, its first unit built as Hughes Hall in 1927, has a rich and interesting history. “I was also quite shocked by how bare the dorm rooms were 40-50 years ago. Students have so much more stuff now!” A brief history of Friley Hall, published in 1980, can be found in the online version of H. Summerfield Day’s The Iowa State University Campus and Its Buildings. The book can also be found by searching the library’s catalog. Commencement in 1936 - one of the many additional images in our collections. As is the case with most of our online photograph collections, the images of Friley Hall on Flickr are only a small portion of the photographs we have of Friley Hall here at the University Archives. In addition, as noted above, we have numerous photographs throughout our collections. As Ashley commented, “The Special Collections Department has A LOT of pictures, many of which are in excellent condition. I think it’s unfortunate that not many people know about them or look at them.” Come visit us if you would like to see more! Ashley will be graduating at the end of the semester, and attending graduate school for library and information studies in the fall. We have enjoyed working with Ashley, and wish her the best of luck in her future endeavors!